First Impression: When Salsa meets Mime. Second Impression: I’m in a box, cha-cha-cha! The introduction of this video is like a found-footage disaster movie. The camera weaves sickeningly around the room while the instructor, Gisele, chases the lens. She shouts some unintelligible stuff about “are you ready?” and again, it seems like she’s urging us to remember where we stored the flashlights and the emergency water. Her friends run around in the background, but then I perceive that they are not panicking. They are dancing to the intoxicating Latin rhythm! The workout becomes much more enjoyable once they decide to hold the camera still. 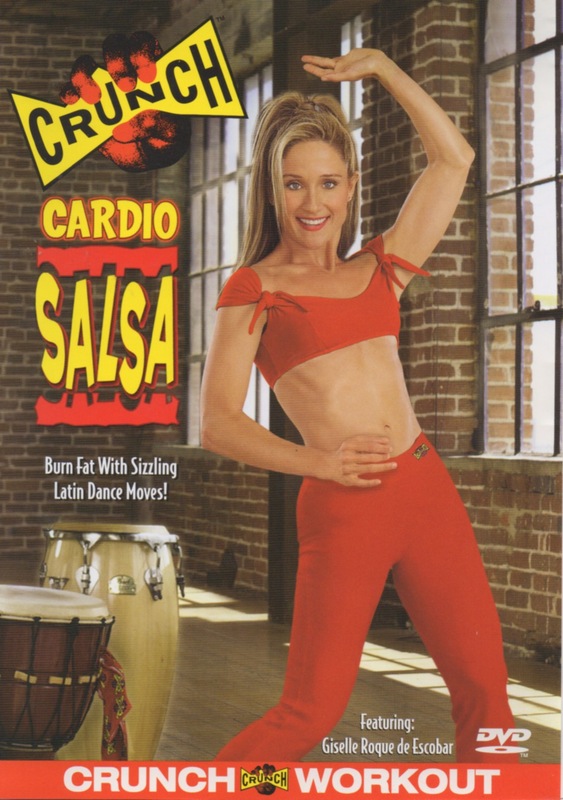 Like many branded exercise franchises, Crunch uses a live bongo player to keep us on the beat. Gisele introduces him and turns out, it’s Ravi from Yoga Booty Ballet! He is now Exercise Video Famous. At a moment in time when everyone is expected to be famous for something, this is no small feat. This time they’ve flat-ironed his hair and given him a Crunch tank top that is way too small. The Crunch logo, of a red angry demon’s hand, is positioned on his chest so it looks like it’s squeezing his heart. The camera doesn’t linger on Ravi for very long, though. Gisele leads us through the warmup and a number of combinations. This is definitely a DVD that was made with the end user in mind. When Gisele says right foot, she moves her left foot, so it looks like a mirror of your own right foot. There are also lots of closeups of the footwork at the exact moments when you are thinking, “Now what foot are we on? Look at that dimple! Listen, Johnny. I think your future self wants to give you some advice and tell you not to buy that private island. It was/is/will be a total money pit! Ditto for the yacht. This entry was posted in Reviews and tagged 45 minutes, abs, calisthenics, cardio, challenging, corporate, dance, exotic, fun, talky, trendy. Bookmark the permalink.